I'm not a accessory heavy type girl. I don't wear lots of jewellery, or even own lots of jewellery infact. I'm minimalistic; my job and being Mummy isn't conducive to lots of jewellery. Mostly these days I just wear my wedding ring and stud earrings, but these are two pieces of jewellery missing that I wish I could wear more. My engagement ring, which is damaged and in long need of repair. I haven't worn it since last May and miss it daily, but in times of late maternity leave, recouping after returning to work and then Christmas, we can never seem to justify the cost. So it sits in the drawer. Who knows, maybe it will romantically reappear on my finger for Valentine's Day, or my birthday... hint hint Mr. Morgan! But then there is Anabelle's bracelet, which is my favourite accessory, because when I wear it, it feels like I'm carrying a piece of her on me, her handprint. It was made by Pitter Patterns. I had found them while I was pregnant with her and thought it was a beautiful idea, not realising at the time how urgent idea would become. I don't think fingerprint/handprint jewellery was quite so popular then. After we knew she had grown wings we contacted them and they quickly sent us a pack out so we would be able to take special handprints for them to work with. We asked them to take extra special care of them, explaining how precious the handprints were to us, and that we would only be able to take them once, so afterwards the lovely company sent her handprints on paper back to us so they could go in her memory book. 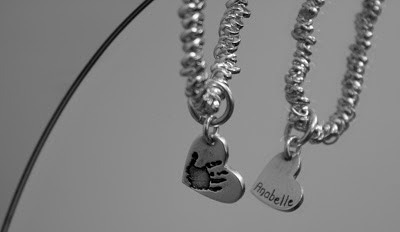 Around her due date and beautiful bracelet arrived, her hand print on one side of the heart, her name on the other. I've stopped wearing daily in recent months for fear of losing it, especially as twice since the summer I thought I had lost it. I can't describe the sickening, frantic feeling, but I was beside myself and sobbed. The first time we were on holiday in Plymouth and had visited Looe for Xander's first trip to the beach in August. I took it off to change him and had obviously automatically put it inside the pouch of the beach bag, yet I hadn't remembered doing it. When I noticed it was not on my arm sometimes later I felt instantly frantic, panic swept over me as I thought it must've been lost in the sand. But it hadn't. It was ok. Found and worn again. The second time we were on holiday in Hartlepool in October. We'd taken Xander swimming in the park's pool and obviously I'd taken it off to go in the water and not realised I'd not put it back on afterwards. After swimming, while we were having a drink in the bar, Xander had a series of horrendous nappies (and was the start of a week of illness for us). I thought I'd automatically taken it off to change him as I often do, and when we had finished changing him, I looked for it, all around the baby change toilet, and couldn't find it. I couldn't find it and again I was frantic. We emptied the change bag, the swim bag, we emptied the nappy bin for goodness sake! But we couldn't find it. It seemed lost forever. Back in the car to drive back to our caravan I sobbed and sobbed, while all Jon could do was hold me saying he didn't know how fix it. 'Only' a bracelet but it felt like I'd lost the piece of her I had left. It isn't 'only' a bracelet at all. I'm relieved to say on emptying the change bag again, through my tears in the caravan, her bracelet was found. Deep in the pocket where I carry my phone and purse. Somehow we'd missed it in our panic; and we had both looked. A miracle if you ask me. We made the decision that day, that I was taking it off more and more frequently changing Xander, that I was taking it off because Xander was pulling on it and playing with it and scared he would break it, and that it was probably best not to wear it frequently anymore. I'd already stopped wearing it every day, and now it was going to be left in the drawer even more, because one day, it really would be lost and I would be grief stricken all over again. So now I wear it only at the weekends, maybe only once a week. I miss it. My arm misses it. It knows it isn't there. As bizzare as it sounds frequently throughout the day I get a 'sensation' around my right wrist, I find myself rubbing it, as if my sub-conscious is searching for Anabelle. Its precious to me. I feel guilty for not wearing it, maybe we can find another solution, would a simple necklace with her handprint on be better and tucked away near my heart? But anyway, for now, I hope one day, when the nappy changes have finished and there is less need to take it off, that I can wear it daily again. Adorable especially for new mommies!